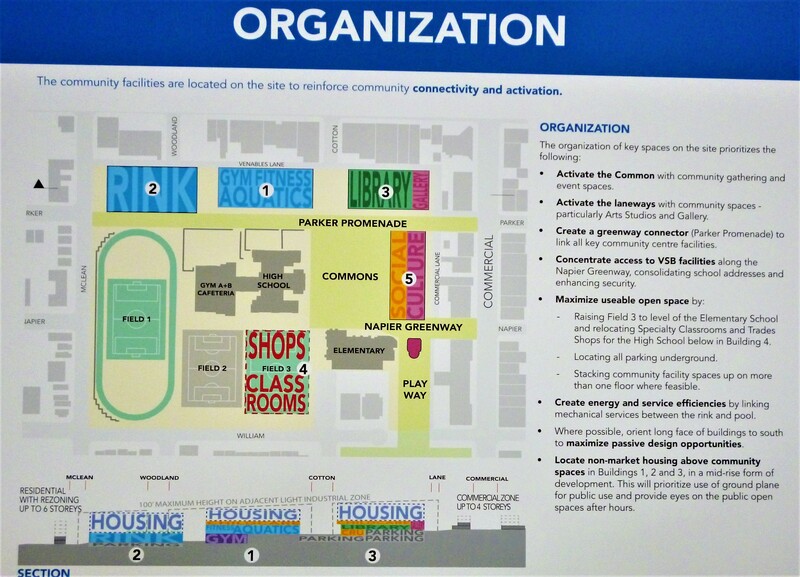 Today, the Britannia Renewal Master Plan — or at least the consultants’ draft of it — was released at a Presentation and Open House display in Gym D at Britannia. Today gave us a welcome break from days of rain, and there was a fairly good crowd of locals assembled for the presentation. In this plan, the heavy lifting for both major amenities and housing runs along the Parker Street edge of the site, and takes advantage of the slope — equivalent they said to six storeys — running east-west across the site. 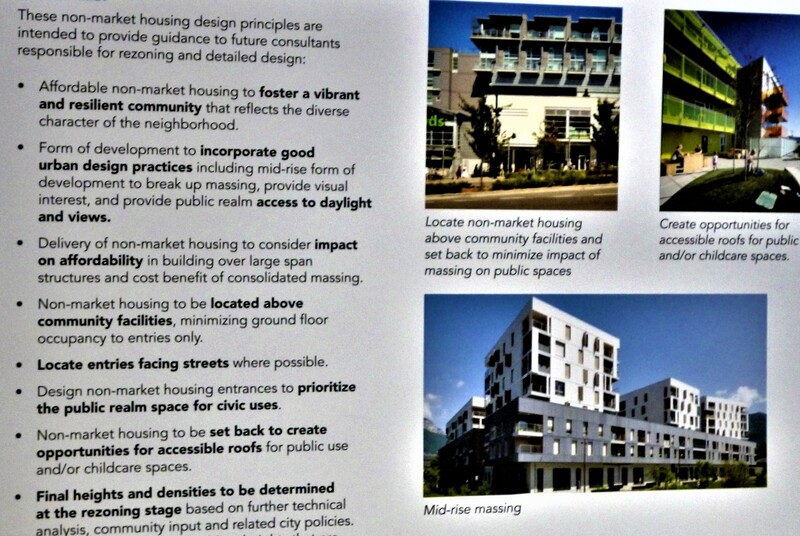 The controversy for many is whether housing should be on the site at all, and if so, where should it be. 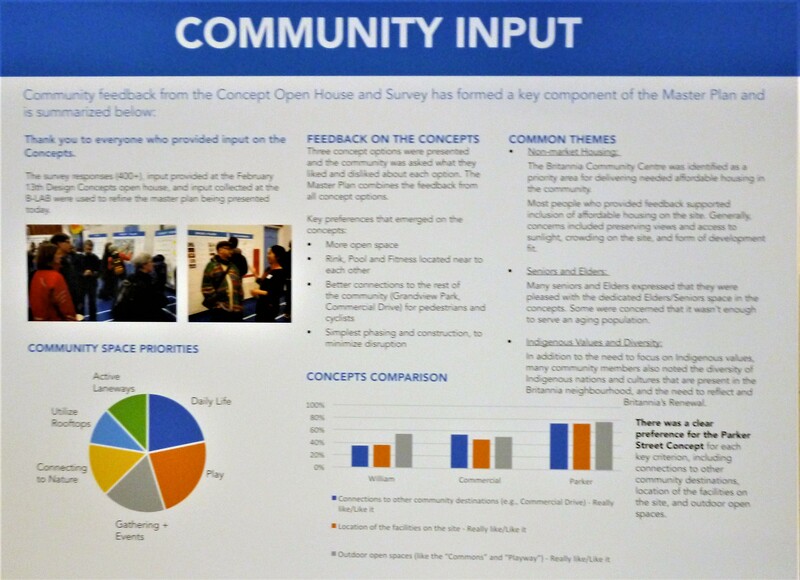 The consultants made it clear that housing on the site was a requirement received from the City, and that it should be above community amenities. 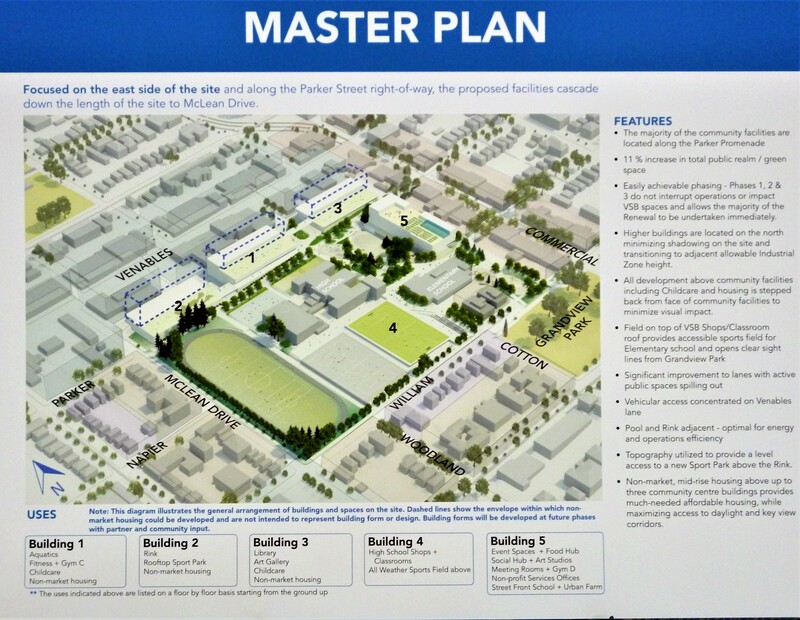 This has created some design constraints, which they have tried to solve by placing the large community facilities in a block along Parker, with housing above. To get the number of units required, they are relying on the discretionary height in the IM zone along Venables which can go to 100 feet. (Note that other areas of the site will be designed to match the maximum discretionary height of 6 storeys in the surrounding RM zones, and 4 storeys along Commercial). The consultants were asked about the engineering required to put housing above facilities such as ice rinks, pools, and gyms that need wide clear spans without central supports. They agreed that the engineering would be significantly more expensive. However, they believe that with the cost of land in the City, the additional engineering will still be less expensive that buying a similar size parcel of land nearby. I am in a minority among friends and colleagues in supporting significant housing on the site. 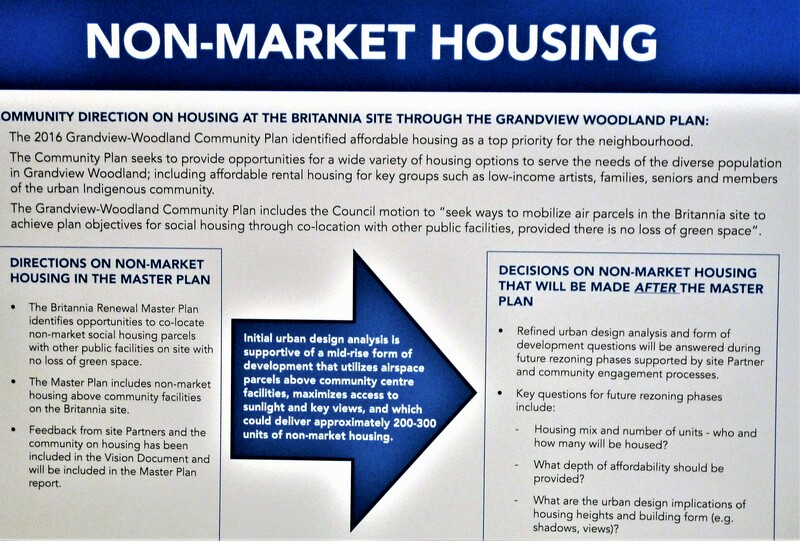 I had three caveats: all the housing had to be public not market; no green space was to be sacrificed; and the housing units should not be too high. The first two requirements have been met, and the third — the height — has still to be determined. However, I assume they will go for the full 100 foot as discussed. I would not care for that, but the need is so great that I would probably gnash my teeth while nodding in agreement. 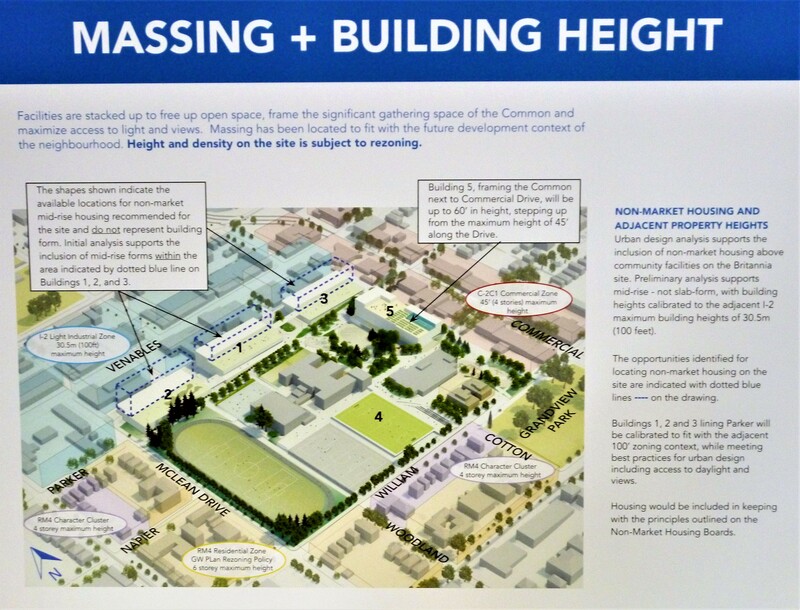 Elizabeth Murphy pointed out that, if the housing was not to go above the facilities, then 10 storeys would not be needed (the facilities — rink, pool, etc — will be at least two or three storeys in height by themselves). Her preference is that the City buy enough land along the IM corridor of Venables to accomplish the same level of housing in smaller units. That is a very reasonable position. However, the cost of land would make that extremely expensive and, just as important to me, I would like to retain that industrial land for industries and employers to develop jobs. We are to expect no more news until the Fall or Winter of 2018 when the rezoning discussion is set to begin. At that time, the massing and numbers of housing will be established. I only hope that the serious debate about housing does not distract from all the other benefits we can receive from a thorough renewal of our most important public space. This entry was posted on Saturday, April 14th, 2018 at 6:58 pm and is filed under Britannia Renewal, Other Writings. You can follow any responses to this entry through the RSS 2.0 feed. You can leave a response, or trackback from your own site.